Description Apply polygon-defined mutes to gathers. For each gather, set samples to zero based on a polygon. Choose to mute inside or outside the polygon region. Specify multiple polygons to apply a spatially varying mute. The muted region will be interpolated between the listed polygons. Each included polygon must be at a distinct gather location. 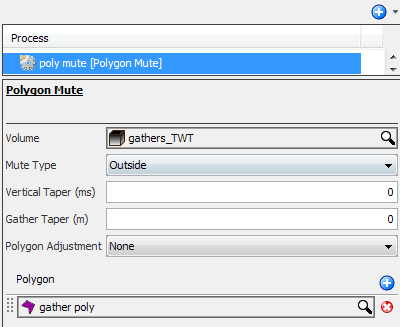 Apply multiple Polygon Mute processes to mute different regions within the gathers. Polygons must contain only a single shape. Select Polygon Mute and type a name for the process. In the Details Panel, choose an input gather volume. At Mute Type, select whether to remove the data inside our outside the polygon. As a prerequisite, a polygon is required for this process (see Creating a Polygon). Input a vertical and/or gather taper. The polygon mute can also be adjusted to hang off a horizon or a header. If either is chosen, select a horizon or header respectively from the drop down list. Otherwise, select None. Click the Add icon to select one or more gather polygons (polygon must be picked in gather domain). If more than one polygon is chosen, a header must be selected to interpolate between polygons. First listed polygon will have priority — polygons can be moved by clicking and dragging the polygons in the list.